English painter; born in London Sept. 16, 1860. He received his artistic training at Heatherly's, at the schools of the Royal Academy, at the Academy of Munich, and at the Ecole des Beaux Arts, Paris, where he studied under Cabanel. His first picture was exhibited in the Royal Academy in 1881; and since that time he has continuously supplied some of the main attractions of that exhibition, his vigorous "Cassandra" (1886) and "Niobe" (1888) having established his reputation as a painter of classical subjects somewhat after the style of Leighton and Poynter. Other paintings of the same character were "Hercules" (1889), "The Judgment of Paris" (1890), "Echo and Narcissus" (1894). Solomon has shown distinction as a portrait-painter also, his portrait of Mrs. Patrick Campbell attracting special attention from its novel arrangement of lights. He was elected an associate of the Royal Academy in 1894. Solomon has shown marked interest in Jewish affairs. He was one of the founders, and for the first ten years the president, of the Maccabeans, which society owed much of its early success to his genial personality. This interest has been displayed in his art also. 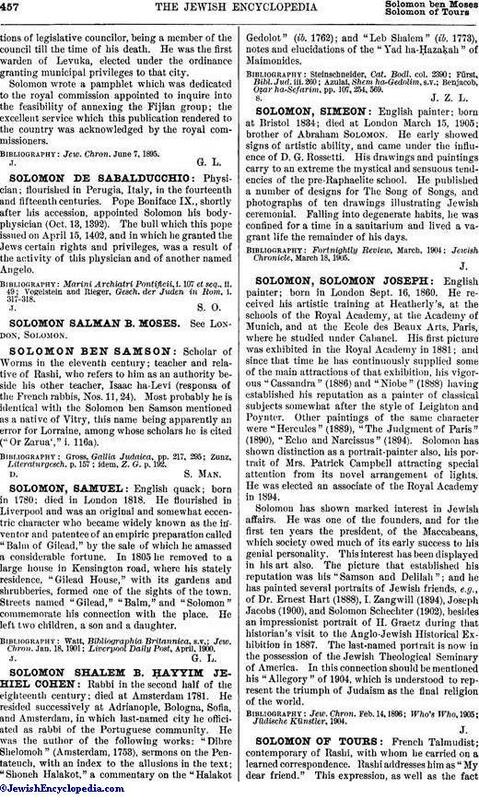 The picture that established his reputation was his "Samson and Delilah"; and he has painted several portraits of Jewish friends, e.g., of Dr. Ernest Hart (1888), I. Zangwill (1894), Joseph Jacobs (1900), and Solomon Schechter (1902), besides an impressionist portrait of II. Graetz during that historian's visit to the Anglo-Jewish Historical Exhibition in 1887. The last-named portrait is now in the possession of the Jewish Theological Seminary of America. In this connection should be mentioned his "Allegory" of 1904, which is understood to represent the triumph of Judaism as the final religion of the world.